Welcome to Luskan old friend, known as the “City of Sails”. If you’ll just follow me I’ll take you straight to my ship. Wouldn’t want anyone to get a good look at you. The Captains don’t know your face yet, and trust me when I say you want to keep it that way. Oh don’t worry, you’re safe enough – as long as you don’t have any enemies that you didn’t tell me about. Last thing I need is to find out you’ve got some sort of Archnemesis – October’s Campaign of the Month! Now, climb aboard and we’ll get underway. Once we’ve left port I’ll introduce you to whozyourdm, the GameMaster for this fine vessel of a campaign. Hello, I am from Greece and I live in Athens. I work as a developer in a software company. You can drop me a message on facebook if you like, or visit my youtube channel where I upload some fanmade trailers for fantasy gaming inspiration. Soon I intend to upload some of our full D&D sessions, there. We are really excited about this! Obsidian community, you have our many thanks! Tell us about Archnemesis in a nutshell. How did it come to be and how long has the campaign been going on? We started Archnemesis last September, so it’s one year old (Happy Birthday!). We wanted to play the 5th version of Dungeons and Dragons and since Forgotten Realms is our favorite setting, we wanted to explore the new era after the Spellplague. 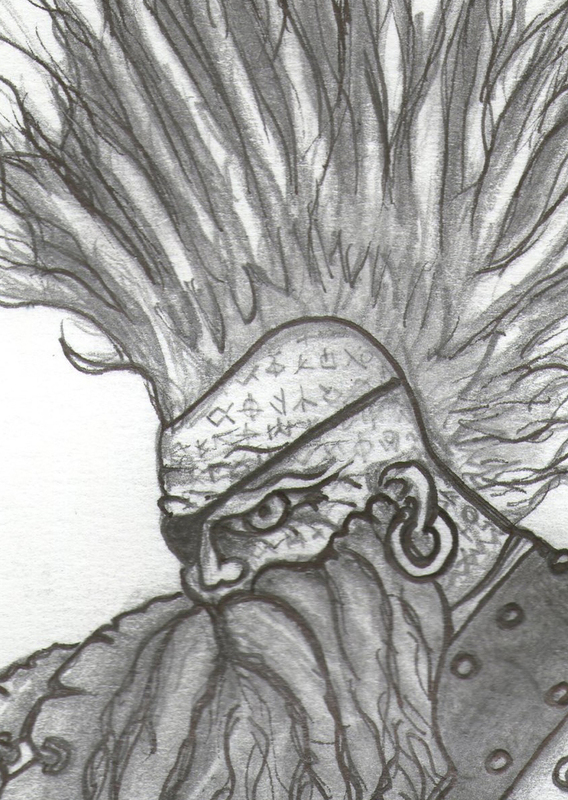 Archnemesis, started as a pirate themed, urban campaign, with more medieval characteristics than high fantasy. As the story goes by and the characters level up the theme swiftly turns to epic fantasy. They beginning of the campaign takes place in Luskan, where the high captains plot against each other and fight for power over the city of sails. The heroes are caught up in the political intrigue and they discover greater powers behind the Captains. The drows of Bregan D’Aerthe, the Arcane Brotherhood and the Church of Umberlee seem to have hidden agendas. Luskan is in the brink of war with Neverwinter, while a huge horde of the Many-Arrows Orcs, under the command of King Hartusk, is ravaging the Silver Marshes and is coming on their way. Once a week we gather around a big wooden table, with candles, pen and paper and a heavy handmade dungeon master screen. Sometimes, when we want to play some background story or a private session we use the online platform. Your campaign is run on the Dungeons and Dragons 5e system in Forgotten Realms. What is your experience of working with the new rules in a time of the Renewal of the Weave? 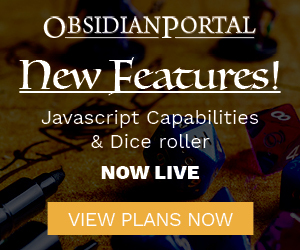 Do you implement any custom changes to the Faerun of your personal campaign? I really enjoy the new system and I think the advantage/disadvantage rule is a very good addition to the game. In my opinion the new system puts roleplaying and character development in the center on the game and facilitates in an overall balanced gameplay. Of course we make our own house rules, as you can see in our wiki, but we try not to overdo it. As long as the story is concerned I try to keep in line with the official events that occur in Faerun the year we play, 1484 DR that is. I use those events as guideline and I give them a little (or a little more) twist. Also I use some Easter Eggs, from previous campaigns, general stories and other games. The players seem to like that a lot. The role of magic in the DnD system has always been a matter of debate on how it is portrayed. With the launch of the 5th edition I was given the opportunity to create a character that could incorporate a sincere confusion in regards with magic and the arcane exactly because the whole backstory of the edition includes that. Therefore playing in a world that magic is the stuff of Legends and it suddenly reappears leaving your character in a position that he has to respond to this revelation genuinely, is really a ton of fun. The new set of rules add huge flexibility to the way the game is played. Is a lot easier to role-play in this setting than it was with v3.5. Although the way the rules have been worded, role playing is not a must. So if you don’t feel like role playing you can skip it and stick with rolling dice. Of course, a lot of the rules are a bit ambiguous, desperately need errata in some cases. The new characters customization (backgrounds, archetypes etc) offer big diversity in each class but not enough imho. Sometimes characters feel out of place or out of time. Maybe a bit more refinement can be done on the actual classes, or more archetypes included. The Renewal of The Weave, feels a bit too medieval for my own pleasure. Of courde our DM is doing a great job of keeping magic feel like “magic” and still be able to reward us with the fantasy that it entails. I have played D&D v3.5 & Earthdawn. I would really like to play the Vampire The Masquerade system and that new system for Lord Of The Rings, that I recently heard about. Factions and Organizations seem to be quite an important part of your campaign. Can you say more about this? I believe that the idea of the Organizations gives more depth to the story. Different alliances can provide interesting quest hooks, multiple possible paths for the players to follow and give the opportunity to the players for personal character development. They may be a party, but everyone is unique and Factions can help showing that uniqueness. Fantasy novels and movies of that genre are great inspiration. Also reading about historical events and details of life in the medieval times. But most importantly, when I need inspiration I search this incredible amount of fantasy artwork in the web, while some epic soundtrack comes out of the speakers. 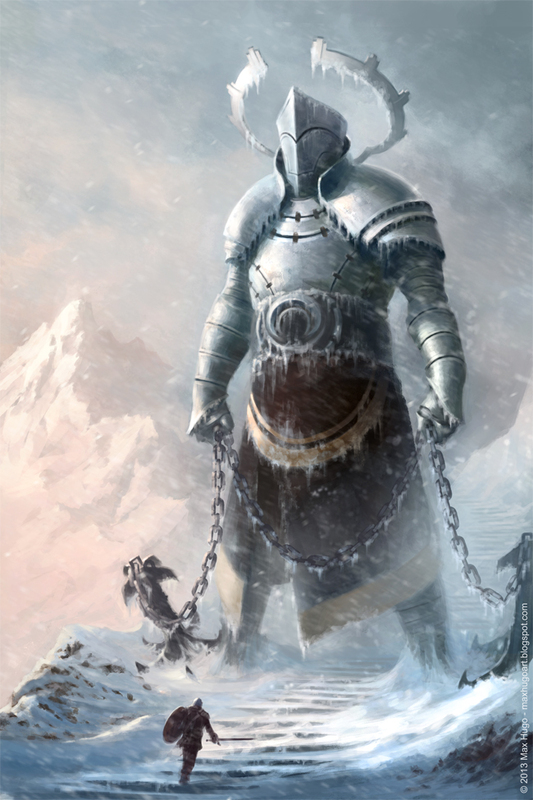 Seriously, hearing Dhovakin: The Song Of Dragonborn and seeing that image, are you not inspired? It all started when I was around 8 years old. It was 1994 and my father gave me a box, with a Barbarian, a Dwarf, an Elf and a Wizard drawn on the outside. 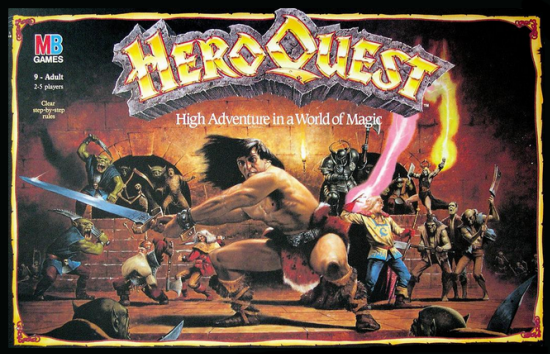 I still remember the big golden letters that read, HERO QUEST! Ah, that still brings tear in my eyes . . .
My friend Ianos, who plays Mr. Diploma (Harry Westra) in Archnemesis and is also a GM in The Heart Of Darkness campaign, in the Earthdawn system, introduced me to obsidian portal about a year ago. Not only I find it great as a campaign planning tool, but also its community brings us all a little bit closer. What does the future have in store for the characters in Archnemsis? Without giving the game away, is there anything you can surmise……? Well, war broke out between Luskan and the Lords Alliance. The Ork-King Hartusk is ravaging the Silver Marches. And an elf priestess Chosen of Mieliki seeks to awake the sleepers in Icewind Dale. It’s an open world campaign and no one knows what will happen next. Are they going to fight a war? 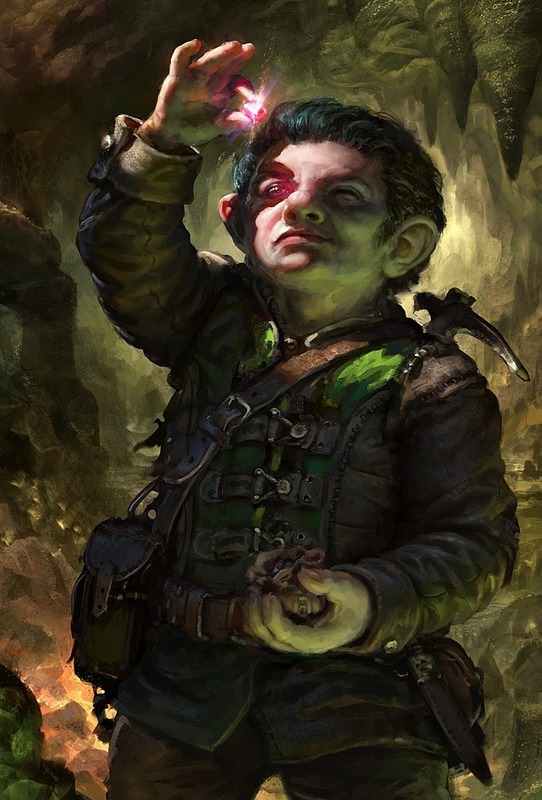 Will they chose to aid the Dwarfholds against the Orcs? Or will they visit Bryn Sander, where another kind of darkness infects the ice? The “Items” section in Obsidian Portal is now an option that has to be chosen. You have done so, and in quite some detail. Would you recommend this to other newer GMs starting out? It suits as well, as a quick reference, from our cell phones or tablets, when we are in the middle of the session and we want to remember the use of a specific item. Also, I can keep track of the overall power of the items the players possess to keep a balanced play. Highly recommended. How often do you use the Obsidian Portal Forum Threads? How do you find the recent changes to the Forums? Every time we have a disagreement about the rules, or we need some additional resources, extra rules or fluff we use the forum to exchange opinions and take decisions. It saves us game time when we gather around the D&D table. And believe me, that time is valuable. There are a few things that come to my mind, but if I have to choose one thing, then I would say that it helps me see the point of view of the players, through their logs. After all every D&D session is a collective work, created by our combined fantasies. It’s really interesting to read the story as they live it. That’s tough. Too many highlights in this one (and too many cliffhangers, as well). I would say that the greatest moment of that party was the time when they tried to save the priestess of Tymora from the hands of the Yuan-Ti. In order to find her, the halfling rogue, used a cursed book that resulted in the summoning of a powerful devil in Luskan. After a perfectly executed rescue mission, with tactical play and all, the players managed to save the woman, but when they returned to the temple the devil had killed everyone. It was a milestone for the players and when emotions comes into play, the characters are really fleshed out. Seeing a huge dragon fighting a huge kraken, while fleeing a treasure island inhabited by lizardfolk worshiping the aforementioned dragon who engage the Sahuagin worshiping the aforementioned kraken! Choosing a highlight of our campaign is a bit difficult since there are so many great moments. For me and my character, a highlight would be the time that he (the character) accidentally brought a devil to walk the earth due to its extreme greed, curiosity and naiveness. Game Masters listen to your players! Collaborate and let them stir you to the way they like to play the game. However, keep in mind that you can’t satisfy everyone all the time. Sometimes, there will be blood, I tell you! But, the secret is to keep it outside of the game time. Make your players understand that when you play a role playing game, you PAY a ROLE. Immersion, is the magic component for a great Dungeons & Dragons session. See you, when the dices roll again! And that’ll do it for this month folks! Keep those nominations coming and we’ll see you next time. Great interview with many insights…..and I love the pics! Thank you very much twigs.